Swinging for STEAM Registration Open!! 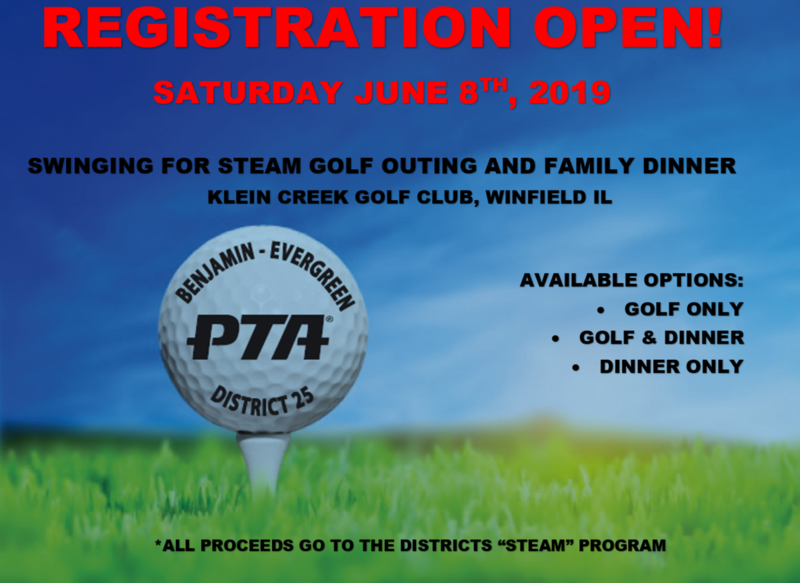 Welcome to the 2nd Annual Swing for STEAM Golf outing and Family Dinner that will take place at Klein Creek Golf Club on June 8th. Follow the links below to sign up yourself or your foursome for golf and/or Dinner package. This is a fun district wide family event. Kids are encouraged to golf and all families are encouraged to join the golfers for dinner at Klein Creek Golf Club. There will be raffles, a great door prize for all golfers, and contest prizes for putting, closest to the pin, longest drive, and straightest drive. There will also be a silent auction available at the dinner. For all interested companies and supporters, we are accepting hole sponsorship, table sponsorship, raffle/auction donations and monetary gifts. All of this information is covered in more detail on the attached documents and sign-up link. 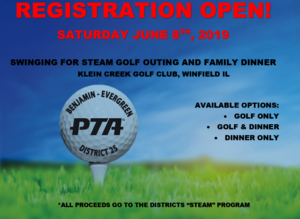 Thank you for supporting this Benjamin/Evergreen PTA event that will benefit our students’ STEAM programs for the 2019-2020 school year. **Direct any questions to Tony Del Preto or Missy Day “Golf Outing Co-Committee Chair” who can be reached at adelpret1@gmail.com 630-947-4601 or missyday05@yahoo.com 630-669-3024.